The Wheel of Engagement is a process tool for structuring engagement processes. It can be used by engagement or sustainability practitioners for participatory processes in communities, for example when creating the community based vision for the future. It may be useful to get a meta-view of the enabling factors that drive public engagement. Within the wheel, a chronological series of enablers are grouped into four main themes. The figure implies that the process can be linear, i.e. start at Initiate and end with Engage. 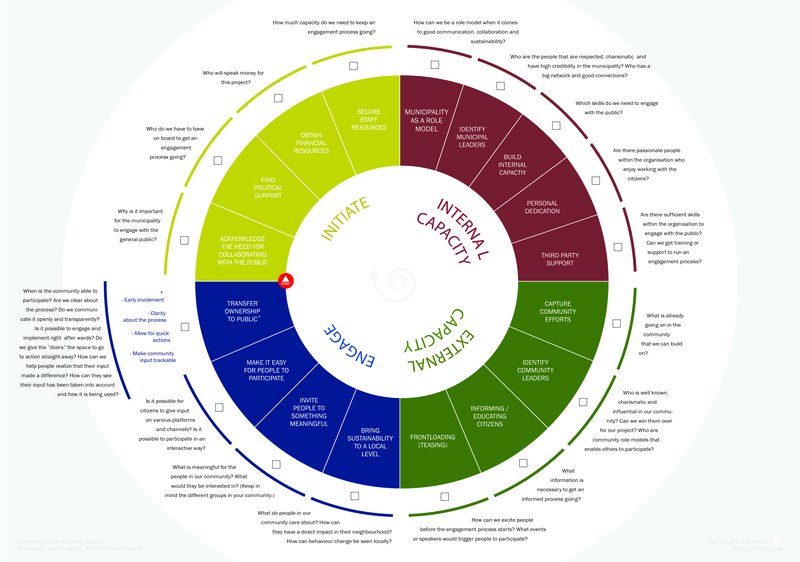 However, the spiral in the visualization shows that the process can also be iterative; some engagement processes need to be repeated, while others simply build off one another. The Wheel of Engagement can be downloaded together with our How To Engage guide, see links below. The guide is designed to be printed on Din A3 paper and folded into a cute little booklet, hence the folding instructions. Other formats, including a version for online reading will follow soon. We owe a big Thank You to Adrià Garcia i Mateu for the graphic design.